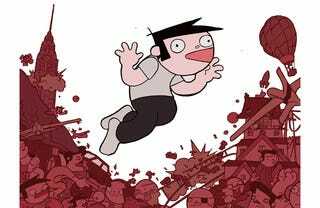 Jimmy Yee, the protagonist of Jason Shiga's webcomic Demon, just wants to die, but he's stuck in a supernatural logic puzzle. Every time he tries to kill himself, he wakes up in his motel room unharmed with everything not quite how he left it. What's going on? And what will Jimmy do when he figures it out? Shiga is known for high-concept comics like Bookhunter (about Oakland librarians trying to recover a priceless book) and Meanwhile (a brilliantly constructed choosable-path adventure about alternate timelines). While Demon has a much more morbid—not to mention violent—tone than Shiga's recent work, it still has that pleasantly mind-bending quality that makes Bookhunter and Meanwhile so much fun. When Jimmy Yee hangs himself in a motel room, he wakes to find that he's still alive. So he rewrites his suicide note and gives it another go—and then another and another. Each time, he wakes in the motel alive, but with the room slightly different than how he left it. Is he being mystically rescued? Is he waking up in a different dimension each time he attempts to kill himself? Shiga plants clues throughout the early pages, so that when the bizarre truth is revealed, you may want to go back and reread those first couple of chapters. Now that Jimmy has learned why he keeps failing to kill himself, what will he do with that information? Knowing Shiga, he'll have some surprising tricks up his sleeve as Jimmy abuses his newfound power. And judging from the story so far, there will be plenty of gruesome humor along the way.